The opening chapter of Alan Jacobs’s latest book is titled “Six Stories.” It is a loosely connected series of vignettes, spanning several thousand years, from the end of the Trojan War to the near-present. In each of these vignettes, the characters confront (in one form or another) the ancient question, “unde hoc malum?”: “whence this evil?” The Locrians, believing themselves cursed for the hubris of their ancestor Ajax, offer an annual sacrifice of two young maidens; the Urapmin of Papua New Guinea fret over the fact that their conversion to Christianity has not resulted in their moral and spiritual perfection. “Six Stories” is an apt beginning for this wide-ranging, instructive, and slightly disheveled work. Jacobs’s book is, fundamentally, a collage. He promises no more, remarking in his introduction that he has written “an exemplary history,” a story that emerges in its coherence only as its many petits récits accumulate. Comparisons that come to mind are P. T. Anderson’s Magnolia and Ira Glass’s This American Life. Even so, Jacobs’s story of original sin—really, the story of the question “unde hoc malum?”—lacks impetus. This is not a criticism. Jacobs’s story (such as it is) is the story of the regular recurrence of this question and of Paul’s and Augustine’s answer to it. It is also the story of the regular resistance this answer provokes, whenever and wherever it achieves prominence. Regular recurrences do not make for gripping narrative. But Jacobs is a gifted essayist, and his vignettes and attendant commentary more than sustain the reader’s interest. Jacobs does not argue for the Pauline-Augustinian answer: that we all do, and must, behave badly—culpably and yet also by nature. He does, however, exhibit the power of this answer, simply by showing how irrepressible it has been. And he offers a provocative suggestion as to where, precisely, the power lies. We receive our first hint of the book’s central idea in Jacobs’s discussion of an unlikely topic: the rise of the Feast of All Souls. All Saints Day is a familiar celebration and an early one. But saints (in the Catholic sense) are only a subset of the church universal. Around the turn of the second millennium, Odilo, Abbot of Cluny, introduced a new festival: a festival for the rest of us. The Feast of All Souls invited all Christians—the addicted, the doubting, the lazy, the nominal—into work sometimes supposed to be “saints’ work.” If the Feast of All Saints was an occasion to fete heroes of the faith, and to beg their prayers for us sinners (now and at the hour of our death), the Feast of All Souls was an occasion for saints and sinners alike to pray for the souls of the departed—again, saints and sinners alike. The notion of purgatory was just emerging in this period, and the monks of Cluny took it as a particular task to offer intercessory masses for the dead. But in establishing the Feast of All Souls, they invited all Christians to join them in this work. Odilo did not for a moment deny that the prayers of the righteous are powerful and effective. The insight behind the Feast of All Souls, though, was (as Jacobs puts it) that “no prayer by any Christian is useless. Some are stronger than others, but all can pull on the same rope, and every little bit of energy helps the cause.” Odilo set observance of his new festival, aptly, for the day after All Saints Day. We are all to pick up, as it were, where the saints leave off. Jacobs follows the twentieth-century social theorist, Eugen Rosenstock-Huessy, in characterizing the consequence of this new observance as “the Christian democracy of the dead and the dying,” “the first universal democracy in the world.” When we understand everyone in the economy of salvation as both giving and receiving, it levels the ground beneath. No one is useless. And everyone is needy. Or, rather, no one is useless because everyone is needy. Paradoxically, the understanding that we are all profoundly flawed creatures disposes us more charitably toward one another. Or it can. Taken to heart, it means no one can scorn another from a position of essential superiority. The egalitarianism of Christianity is among its noteworthy features. Illustrations are not hard to come by. When one compares the ethics of Kant with that of Aristotle, one is struck by a number of points of divergence. None is more significant, though, than this: Kant thinks in terms of a transcendent law, manifest to every rational agent; anyone and everyone can do their duty. Aristotle, by contrast, thinks in terms of achievement—the successful exercise of personal excellence. Such excellence and achievement, he says, are attainable only with substantial good luck, in the form of a responsible upbringing, ample possessions, sound health, and so on. Aristotle compares the badly raised to runners who can’t find the starting line of the race of life. They can’t not lose. It had not occurred to me before reading Jacobs’s book that the doctrine of original sin proceeds from, or at least resonates with, this egalitarian spirit. But it does. What then would lead people—especially moderns—to resist it? Well, love of babies. Famously wrenching conclusions follow if one conjoins the doctrine of original sin with a high and restrictive view of sacramental grace. But let us not dwell on this point, since the remedy seems so obvious: stop supposing that God’s hands are tied. Jacobs uncovers a number of other historical objections to “Augustinian anthropology,” objections of greater interest. Most reinforce his point about the democratizing tendencies of the doctrine. There are those, for instance, who have directly (even crassly) rejected the egalitarianism itself. Jacobs relates an anecdote about a Duchess of Buckingham who found the preaching of George Whitefield (which invariably began with a proclamation of universal depravity) “most repulsive and strongly tinctured with impertinence and disrespect… and [doing] away with all distinctions.” That it does. I think again of Aristotle, whose ideal man hates to be reminded of any way in which he is indebted to others—in which he is a recipient of grace. And the doctrine of original sin insists that we all live by grace. More subtly and sympathetically, the doctrine has been resisted by modern social reformers, who do not wish to believe in the limited and mitigating character of their projects. In addition to the people you’d expect him to discuss under this description—visionaries like Rousseau and utopians like Robert Owen—Jacobs calls our attention to Charles Finney, the charismatic nineteenth-century abolitionist. Finney was adamant that Christians “should not rest satisfied until they are as perfect as God.” Anything that threatened to reconcile people with a residuum of evil in their lives or in their societies, he felt, was a threat to the cause. The chapter about Finney and abolition is the most profound and disturbing of the book. As noted, Jacobs proceeds vignette by vignette, always piecing his scenes together with a thread of unity. Sometimes it is only a thread, as in Jacobs’s concluding chapter, which juxtaposes the 1854 papal codification of the immaculate conception, Mendel’s early work on genetics, and the Stanford prison experiment. But chapter nine, “The Confraternity of the Human Type,” is powerfully unified around the dominating social and political issue of the mid-nineteenth century, racial slavery. Finney fought it and the doctrine of sin inherited from a universal ancestor. Others defended it, and some quieted their consciences with a theory, polygenesis, that cut (ironically) both against the doctrine of original sin and against the universal kinship of humanity. If there was no universal ancestor, then there could be no universal inheritance. But that was never the point of polygenesis. The point was, if there was no universal ancestor, then maybe Caucasians needn’t see Africans as kin. I have indicated that Jacobs’s experimental (perhaps it should simply be called “essayistic”) style is not evenly successful. My one substantive disappointment with Jacobs’s book was that he does less than he might, characterizing and assessing the modern era, which he acknowledges to have been on the whole hostile to the Augustinian view. In a chapter on sixteenth- and seventeenth-century figures, Jacobs remarks, “despite all the Reformers could do to emphasize our utter depravity… increasing numbers of people, while acknowledging the reality of original sin, preferred to minimize its consequences.” I can think of several reasons why that might be true, some of which come up in passing in later chapters. (Jacobs’s chapter on Rebecca West and the great wars of the early twentieth century is particularly rich. There he characterizes West, at least, as embracing Augustinian anthropology in despair of Augustinian soteriology and eschatology. It is unclear, though, whether Jacobs is prepared to generalize this conclusion. Perhaps he regards this as a necessary corollary of the “exemplary” approach.) But Jacobs never reflects directly on the question, which is regrettable. Which is to say, I was not ready for the book to end. I learned as much from it as from any book I have read in the past few years. And Jacobs’s voice is consistently delightful: at once casual and careful, witty and earnest. 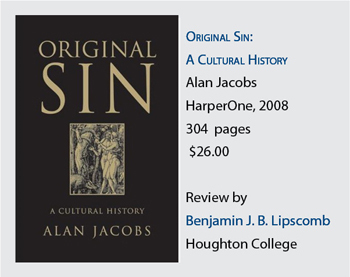 Jacobs tells a host of stories but remarks more than once on the place of the doctrine of original sin in the Christian story, the story of salvation. It is apt, then, that he closes his book with some brief reflections on comedy. Following Auden, he contrasts “classical comedy” with “Christian comedy.” In the former, he says, we laugh at the protagonists, whose arrogance is exposed in the action. The audience is warned but also subtly congratulated. In Christian comedy, on the other hand, we laugh with the characters, having been brought to recognize that, in Auden’s words, “no one, whatever his rank or talents, can claim immunity from the comic exposure.” All have fallen short, and must. Our kinship is grace.